Union Finance Minister Arun Jaitley on Saturday said that India aspires to be a more open economy and stay away from protectionism. "An aspirational India poised to be more open and less protectionist," Jaitley said in his lecture on 'Transforming India: Vision for the Next Decade' at the London School of Economics, adding that country's "emphasis is on infrastructure and rural sectors." The Finance Minister is on a five-day visit to Britain, during which he will meet his British counterpart, the Chancellor of Exchequer, interaction with over 100 business leaders from the UK-India Business Council (UKIBC) and roundtable with prospective issuers, leading investors and fintech leaders, among others. On Sunday, Jaitley will attend a reception being organised by Federation of Indian Chambers of Commerce and Industry (Ficci), the British Council and Indian High Commission. On February 27, he will perform market opening ceremony at London Stock Exchange followed by the roundtable meeting with prospective issuers and leading investors and fintech leaders among others. Later in the day, he will have interact with over 100 senior business leaders from the UKIBC followed by meeting with British Foreign Secretary Boris Johnson. He will also attend a reception being hosted by Queen Elizabeth II at Buckingham Palace in the evening on that day. 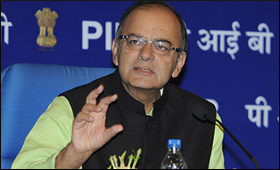 On February 28, Jaitley will meet the Chancellor of Exchequer. Thereafter, the Finance Minister will meet the CEOs at a meeting being organised by the Confederation of British Industry before leaving back for home in the evening on the same day and arriving in the national capital early morning on March 1.